Apart from being a popular fruit, peaches are considered symbolic in many cultures and traditions – in art, paintings and folklore. In China, peach flowers are highly prized since they believed the peach to contain more vitality than other trees, since their blossoms appear before the leaves sprout. When rulers of ancient china visited their lands, they were preceded by magicians armed with peach rods to protect the rulers from super-natural evils. Every New Year’s Eve, local magistrates used to cut peach wood branches and place them over their door to protect themselves against evil influences through the year. In an effort to dispel evil, the Chinese would also shoot arrows, from peach wood bows. Peach-wood carved pits also served as amulets to protect a person’s life, safety and health. Peach seeds are used in traditional Chinese medicine to dispel blood stasis, counter inflammation and reduce allergies. Peaches have been cultivated in Korea since ancient times. The peach is seen as a fruit of happiness, richness, longevity and honour in Korean culture. Being one of the ten immortal plants and animals, the fruit appears in many paintings. A rare peach with 2 seeds is seen as a favorable omen of a mild winter. It is also believed that peaches and peach trees chase away spirits, because of which Koreans ensure that peaches, unlike other fruits are not placed on the tables during an ancestor’s death anniversary. Momotaro, a popular and local Japanese hero, whose name literally translates into “peach-boy”, is believed to have been born from within an enormous peach floating down a stream. He later went on to fight evil and face many adventures. In Vietnam, the blossoming peach flower is the signal of spring, and peach bonsai trees are used as a decoration in northern Vietnam during the Vietnamese New year. Many famous European artists have painted still life with peach fruits placed in prominence. Art historians suggest that the composition of the peaches in the paintings were in an effort to introduce realism. They claim that the renaissance artists symbolically used peaches to represent the heart, while the leaf attached to the fruit is a symbol of the tongue, implying speaking truth from one’s heart. 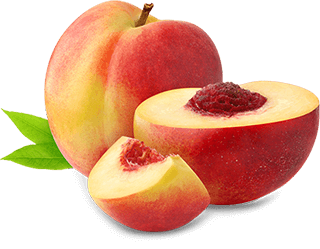 A ripe peach was also used to represent a ripe state of good health.